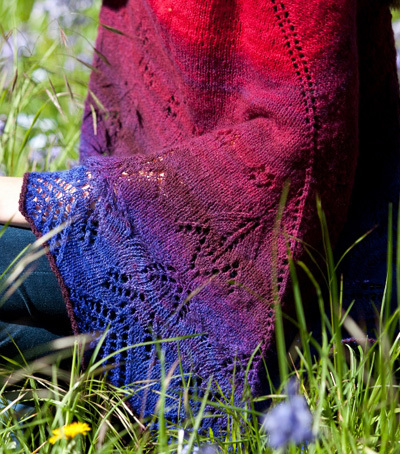 I love shawls -- of that there is no doubt, but sometimes when the tail end I had casually tossed over my shoulder has slithered back around to the front for the umpteenth time I get a little peeved. Yes a shawl pin at the shoulder will keep that elegant tail in its place for a while, but eventually that too will inevitably slither back around to the front so that I look like I have a pretty, but unwanted, knitted tail hanging conspicuously out the front of my shoulder. Inside I would rage -- there must be a better way! Well, there is. 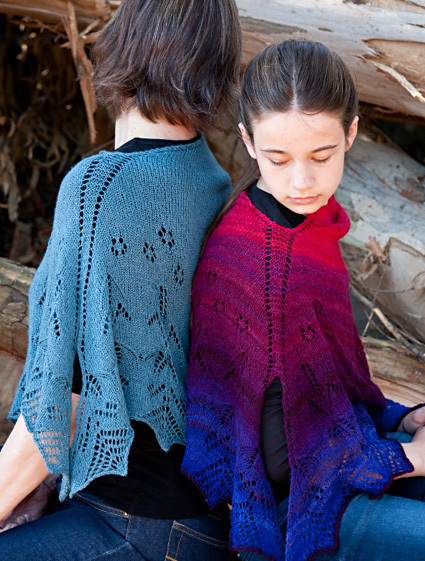 Hybrid Vigour is a shawl that begins and ends as a regular triangular shawl knitted flat, but in the middle the two edges are forever connected in a knitted embrace – no shawl pins, no slithering ends, no more casual tosses of shawl ends over your shoulder. An improved combination of shawl-poncho, Hybrid Vigor will stay put. It still has the drapy ends we all love in a shawl, and those loose ends combined with its asymmetrical shape make it less poncho like than the one I wore in the seventies. And just in case you still love tossing those ends elegantly over your shoulder this hybrid is easily converted into a regular triangular shawl knit flat; instructions can be found on my blog. The lace motifs are relatively easy, and beads are optional. 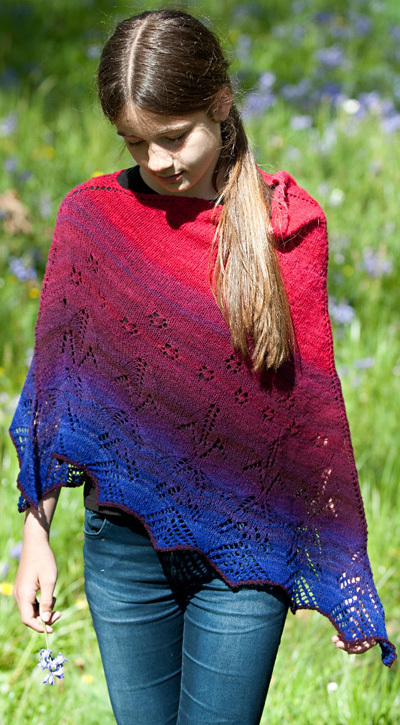 Knit in a gradient dyed fiber/yarn gives the piece a sense of drama, but it’s equally as pretty in a solid color. Rage no more fellow Knitters, I give you the Shoncho! The merino fibre used in this piece was dyed to my specifications, graduating from a blue-based red, through purple, to ultramarine. When spinning merino as a lace-weight yarn I find it best to put more twist into the singles than you normally would. This makes a more tightly plied yarn which is less inclined to matt or felt, and which enhances the lace stitch definition. When spinning a 2-ply yarn from a color graduated fiber, split the fiber lengthwise and spin small amounts of singles at a time (fill each bobbin only about a quarter full), so you can be more assured that the color graduation of the two plies match more exactly. This results in more ends to weave in, but reduces the chance of producing a yarn with a barber-pole effect. Patons Embrace 2 ply [90% Merino, 10% silk; 372 yd per 50 gm ball]; Color: Petrol (910); 3 balls. 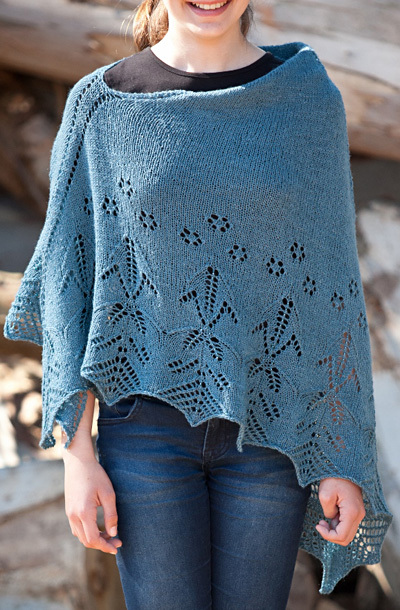 This pattern begins with a small knitted tab and grows outwards from the center of the neck edge, as you would work a traditional triangular shawl. Initially the garment is worked flat (back and forth), later the two edges are then joined to work in the round, and finally the same two edges are separated again to work flat (back and forth). Placing Beads: Beads are placed on RS rows using a very narrow steel crochet hook. To place a bead on a stitch, insert hook through hole in bead sliding bead onto shaft of hook. Slip the stitch off the left needle and onto hook, slide the bead down off the hook and onto the stitch. Slip the stitch back to the left needle and knit it. Placing Beads on Decreases: Place the bead before working the decrease. Next row [WS]: K2, pick up and knit 5 sts in the garter ridges along the side of the tab; pick up and knit 2 sts in the cast on edge. 9 sts. Row 1 [RS]: K2, yo, k2, yo, pm, k1, pm, yo, k2, yo, k2. 13 sts. Row 3 [RS]: K2, yo, k to first center marker, yo, sm, k1, sm, yo, k to 2 sts before end, yo, k2. 4 sts increased. Repeat Rows 3-4 36 more times, to 161 sts. Round 1, set-up round: Kfb, k1, yo, k to first center marker, yo, sm, k1, sm, yo, k to 2 sts before end, yo, pm. This is the new start of round. Do not turn work. With 2 sts remaining on left hand needle, slide work from the opposite edge to end of left needle tip to join for working in the round. 5 sts increased. Round 2: P1, p2tog, (this is the last st of one edge and the first st of the other edge purled together), p2, k to end of round. 1 st decreased. Round 3: K4, yo, knit to first center marker, yo, sm, k1, sm, yo, knit to end of round marker, yo (before marker). Round 4: P4, k to end of round. Repeat Rounds 3-4 15 more times. 229 sts. Round 1: K4, yo, work chart A to first centre st marker (working pattern repeat 4 times), yo, sm, k1, sm, yo, work chart A to end of round, yo. 4 sts increased. Round 2: P4, work chart A to first center marker (working pattern repeat 4 times), k1, work chart A to end of round. Work as set until Chart A is complete. 273 sts. At this point you resume working flat. Change to longer needles when required. Row 1 [RS]: K4, yo, work Chart B to first marker, (working pattern repeat 5 times), yo, sm, k1, sm, yo, work chart B to end of round, yo, remove marker, k2. Turn work to begin working flat. 4 sts increased. Row 2 [WS]: K2, work Chart B to first center marker, p1, work Chart B to last 2 sts, k2. Row 3 [RS]: K2, yo, work Chart B to first center marker, yo, sm, k1, sm, yo, work Chart B to last 2 sts, yo, k2. 4 sts increased. Row 4 [WS]: K2, work Chart B to first center marker, p1, work Chart B to last 2 sts, k2. Work as set until Chart B is complete. 321 sts. Row 1 [RS]: K2, yo, work Chart C to first center marker (working pattern repeat 6 times), yo, sm, k1, sm, yo, work Chart C to last 2 sts, yo, k2. 4 sts increased. Row 2 [WS]: K2, work Chart C to first center marker, p1, work Chart C to last 2 sts, k2. Work as set until Chart C is complete. 345 sts. 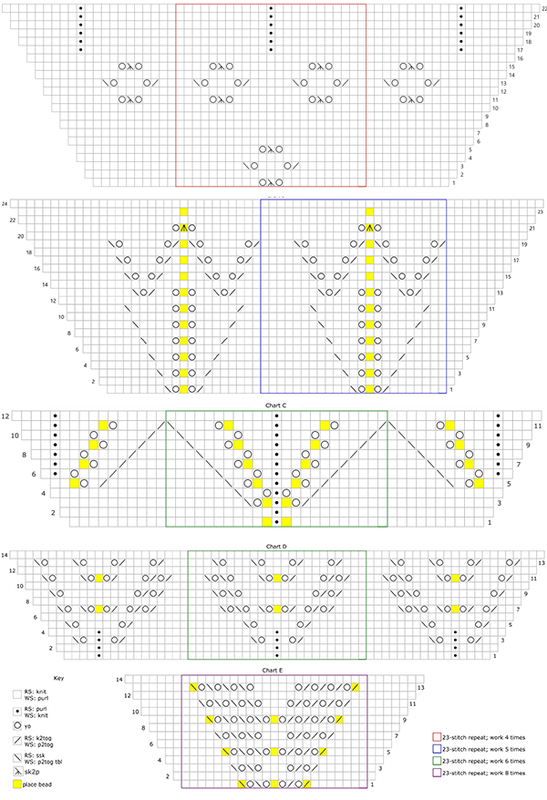 Row 1 [RS]: K2, yo, work Chart D to first center marker (working pattern repeat 6 times), yo, sm, k1, sm, yo, work Chart D to last 2 sts, yo, k2. 4 sts increased. Row 2 [WS]: K2, work Chart D to first center marker, p1, work Chart D to last 2 sts, k2. Work as set until Chart D is complete. 373 sts. Row 1 [RS]: K2, yo, work Chart E to first center marker (working pattern repeat 8 times), yo, sm, k1, sm, yo, work Chart E to last 2 sts, yo, k2. 4 sts increased. Row 2 [WS]: K2, work Chart E to first center marker, p1, work Chart E to last 2 sts, k2. Work as set until Chart E is complete. 401 sts. Bind off loosely as follows: K1; *k1, slip the 2 sts back to the left needle, and knit them together tbl; rep from * until 1 st rems; cut yarn and pull through final st to secure. Weave in ends and block, pinning out the bottom edge points as illustrated. Leave top corner (neck opening) unpinned – simply smooth flat. Mary-Anne lives in Christchurch, New Zealand, and is currently having a blast designing shawls and figuring out weird and wonderful lace motifs with which to embellish them. 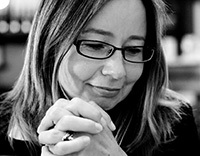 She spins when the whim takes her, and can be found on Ravelry and on her blog, which she now wishes she had started writing in the third person.